Need some tips on lifting conversion? Poking around the web for some fresh and compelling articles on GDPR? We’ve got it all, and even a bit more. 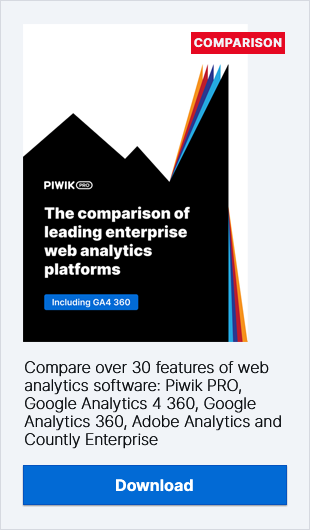 In this post, Piwik PRO team presents GDPR-related posts you shouldn’t miss. Marketers devote a lot effort to create an appealing and captivating opt-in lead magnets that drive conversion rates. Unsurprisingly, as it’s the message that takes the stage. What about the medium? Should it be a PDF file, video or web content? The research team of CXL Institute conducted a comprehensive study to find an answer to this dilemma. To get more details, read the article by Diego Chacon. GDPR: best creative idea ever? In the light of the GDPR coming into force in May, you can easily sense the tension and agitation in the air. However, you might be surprised with the optimistic outlook is shared among professionals within marketing field. Jennifer Whitehead brings you closer to the debate on emerging opportunities, improvements, and hopes that the new regulation can bring. Digital technology is gathering steam in the healthcare and pharmaceutical industry. Organizations within the sector take advantage of technological innovations to better serve their customers and patients. Health analytics solutions fit the bill whether it’s for education advice, emotional support, improving diagnostics or drug development. To get the whole picture, reach to article by Ben Davis. The proposal of GDPR consent mechanism prepared by the IAB aroused much controversy in the AdTech industry. Some even say that the system is so flawed it’s practically unworkable. Read this article from PageFair to learn what exactly makes IAB’s consent mechanism so unacceptable under GDPR. This set of news about GDPR will bring you closer to many practical effects of the new regulation. Among other things, you’ll learn how much British companies will spend on preparing for a new law and how popular a data protection officer position has become in recent months. “Privacy by design” is a concept first introduced to the world in the 1990s by Ann Cavoukian, Information and Privacy Commissioner for the Canadian province of Ontario. Over the years, the term has gained more and more popularity. Now, it has become one of the core demands of GDPR. This article will help you understand general rules around privacy by design and the ways it can benefit your business. We’re Releasing GDPR Consent Manager!